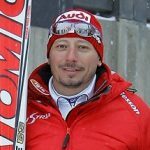 Giant slalom is considered by coaches and racers to be the most technical discipline of alpine ski racing. The best GS racers demonstrate the quickness of slalom specialists and the carving skills of the downhillers. That is why I recommend dedicating about 70% of an athlete’s entire training volume to GS training. This is especially true for juniors and developing athletes. However, simply spending a lot of time on long GS boards does not guarantee that racers will acquire a solid GS technique. A correct approach to developing GS turns is, in my opinion, very important. juniors often either slide their turns or carve very shallow arcs in the fall line. Neither of these turning modes works in a GS course. 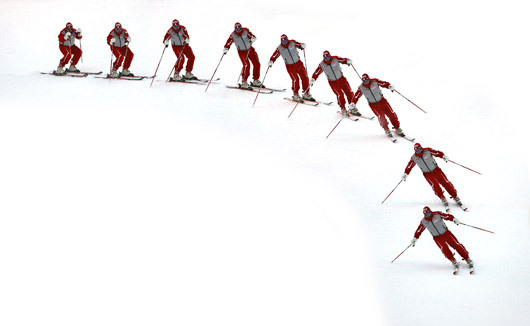 While continuing to practice on their GS skis, using them in this manner, young racers do not get any closer to the real GS turns like the ones shown above. So, what is a solution to this problem? Purely carved turns of a larger radius. Before getting into the method, I would like to emphasize the problem it is supposed to solve. 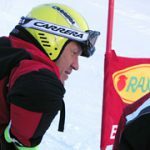 What is at the root of a problem faced by junior racers, who are either able to carve shallow arcs in the fall line or slide their turns? The problem in both of these cases is the same. A skier merely places a ski on edge and stands on it while carving an arc defined by the side cut of the ski. 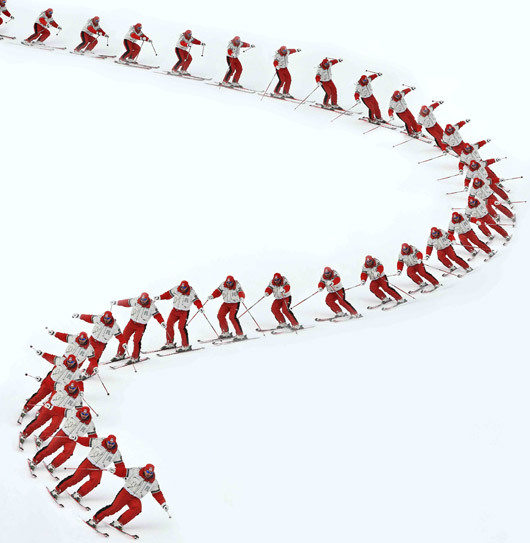 Thus, the skier does not control a shape and placement of the arc of a turn. A lack of proper leg movement. I suggest dealing with each of these problems separately. 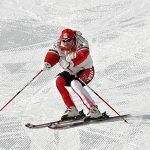 In particular, I use dynamic shallow turns in the fall line for developing the proper body movement for edging the skis. Then, I use extremely round sliding turns for developing the projection of the center of mass (CM) forward and for the proper flexion-extension in the legs. 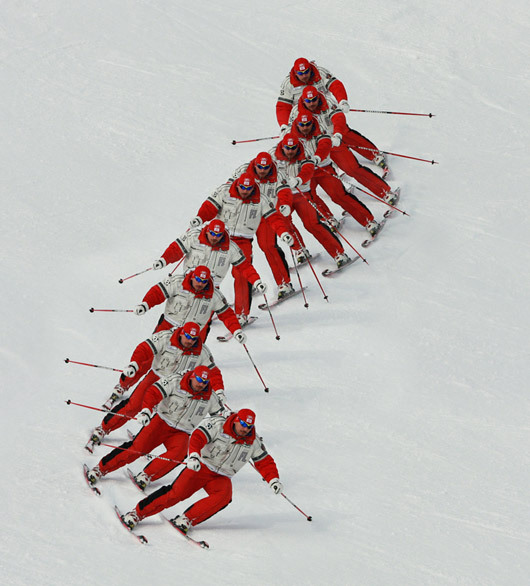 These separately developed skills gradually blend into the proper GS technique. Let us review the dynamic shallow turns, also called “banana-turns” by some coaches. This demonstration of the banana-turn is shot with a camera producing 10 frames per second. 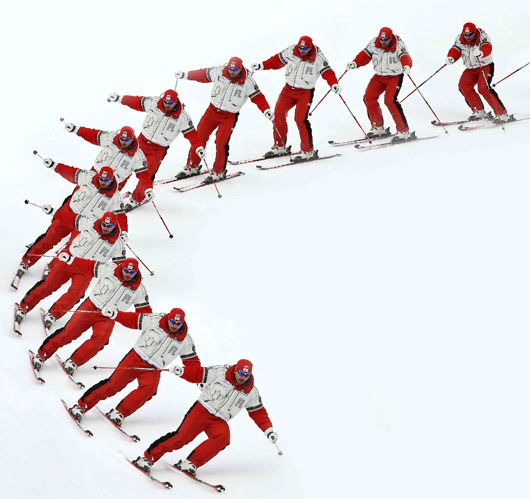 It is not difficult to figure that a skier has executed two turns within a second. With such an extremely quick rhythm, only edging (by moving slightly forward and inside the arc) can be developed. However, other movements are rather difficult to work on using banana-turns. Thus, attempts to work on flexion-extension and forward projection of the CM in banana-turn mode will be mostly unsuccessful. Furthermore, banana-turns do not enforce proper re-centering and skiers often begin to «loose» a shovel of the outside ski. I suppose, like in case with the banana-turns, it is quite obvious why these kinds of turns are called S-turns. 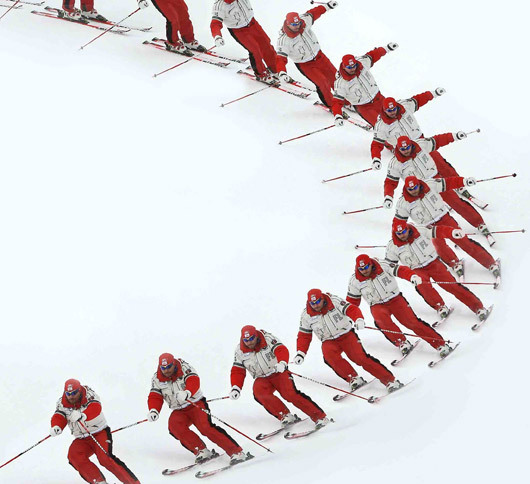 In the above sequence skier executes S-turns on a steep slope. Medium to steep slopes are primarily recommended for mastering the S-turns. So, what are they used for? First of all, S-turns are needed for developing the movements (such as extension-projection) that escape the racer in his or her banana-turns or regular turns. These movements of extension and CM projection are needed for executing proper GS turns. In S-turns, the correct movements can be felt and developed without speed, almost in slow motion. The above sequence is made by the same camera producing 10 frames per second. It is not difficult to figure that one S-turn takes about 2 seconds, while a transition phase in between the turns takes more than half a second. This time is sufficient for a skier to focus on flexion of the legs and on extending into the new turn. The S-turn demonstrated here presents the entire biomechanical cycle of movements used in a GS turn. However, all the movements occur at a much slower speed. The skier creates low edge angles without carving an arc. 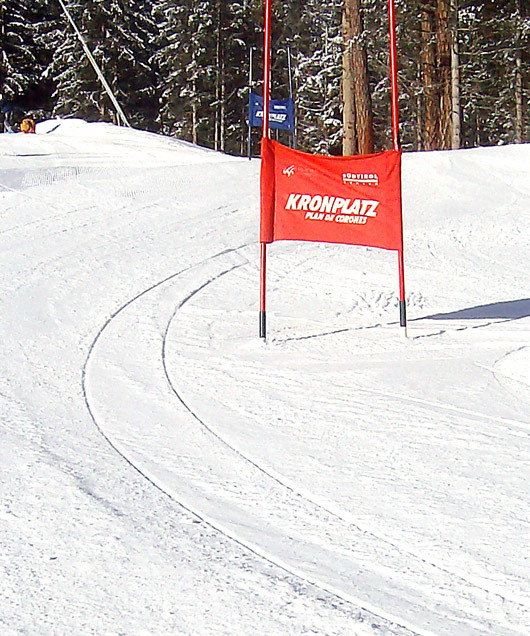 The skis slide on the edges smoothly throughout the round arc of a turn. Smooth guiding of the skis through a long round arc presents a lot of difficulties to young racers who are used to carving shallow (almost straight) arcs executed by edging the ski and only employing its side cut. Although the S-turns are executed at a relatively low speed, it is important to avoid static positions. Continuous smooth movements are the primary goal, as can be seen from the above sequence, where each frame is different from the previous one. A double pole plant performed in this manner enforces a correct upper body position at the completion of the turn. It also adds more exaggerated forward projection of the CM, which places the body more inside the arc. However, the S-turns with a double pole plant should only be used when a consistent turn shape and a smooth execution of regular S-turns are achieved. The next question is how to use both of these types of turns in order to benefit skier development the most. First, we have a banana-turn, consisting of maximum dynamics, edging by inclination and carving clean arcs of a large radius. 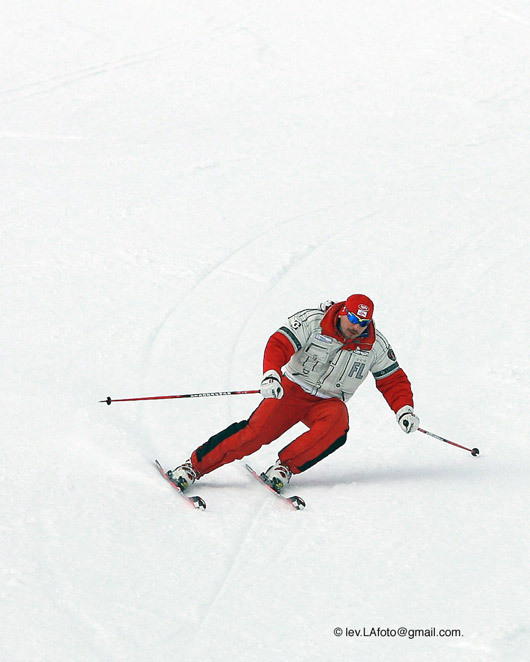 While making the banana-turn, a skier has a minimal control over his or her movements. The main goal is just to feel dynamic edging achieved by displacement of the body inside a future arc. No real emphasis on a transition between the arcs is placed in the banana-turns. For that we use the next approach, the S-turn. In the S-turns, the skier focuses on flexion in-between turns, projection and extension with minimal dynamics that allow the skier to really feel the movements. However, the S-turns inevitably develop static positions. Also, while making S-turns, the skier can lose the feeling of a “clean edge”. The banana-turns develop a feel for edging, but they lack other technical elements needed for transition between the turns. That is why, I do not recommend overusing either one of this exercises. Instead, I usually switch between working in the S-turn mode and the banana-turn mode. I often return to these exercises when a racer experiences problems with the GS turns. For example, if a racer struggles with the leg flexion and projection, I use the S-turns or other drills executed in the S-turn mode. If a racer looses dynamics and a feel for edges, I return to the banana-turns or drills executed in this mode. An appropriate slope for each of these exercises is very important. Doing banana-turns on something too steep may not be beneficial. Likewise, S-turns on too flat of a slope will not produce the desired results. It is worth mentioning that the proposed method works effectively on Super-G skis, as well. It also works on slalom skis, but the use of the slalom skis can produce many side-effects in the form of wrong movement patterns. That is why I recommend mostly using GS skis with the banana turn and the S-turn. 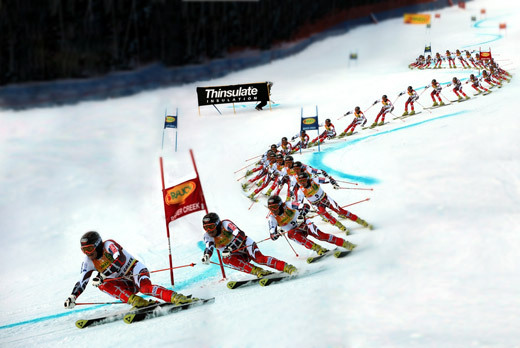 Once a good GS turn is developed, it can be easily transferred to slalom or Super-G. I hope that using a combination of the banana-turns and the S-turns for training in a correct sensible manner will allow many racers to develop good turns and, as a result, have a good deal of success.